Where to start on a day at World Match Racing Tour Copenhagen that brought so many surprises and upsets? On a sensational day’s racing to whittle the Super Sixteen teams down to the final eight for the Quarter Finals, the biggest surprise came at the end of the day when Swede Bjorn Hansen came back from the dead against superior competition. The old underdogs turned around a 0-2 deficit to a 3-2 victory against the younger and much more highly rated Kiwi Phil Robertson. The 47-year-old Swede is a late and slightly reluctant convert to the M32 catamaran after being one of the top-rated keelboat match racers of the past 15 years or more. Winning Match Cup Sweden has been his speciality in the heavy DS37 keelboats, but the heavyweight Master of Marstrand was not expected to progress beyond the first round. Not only has he achieved that, but the Swede is learning how to master the flighty, lightweight M32 catamaran with remarkable speed. 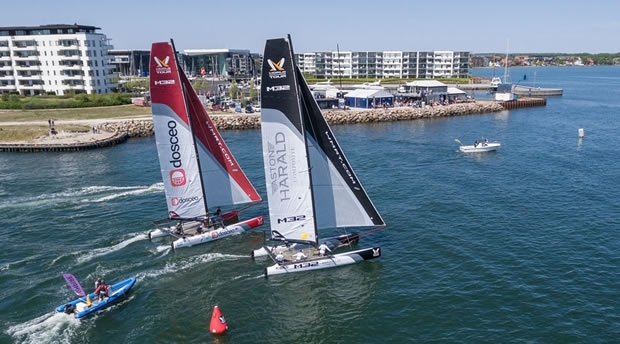 Another much-vaunted team that came up short today was Nicolai Sehested (DEN), TREFOR Match Racing, a strong performer in Fremantle earlier this year and strong in the fleet race qualifying earlier this week. Nicklas Dackhammar (SWE), Dackhammar Racing, on the other hand had only scraped through to the Super 16 from the Sail-Offs and wasn’t expected to put up much of a fight. But the Swede was sharp off the start lines, his manoeuvres were crisp, and he never gave up in a series of matches that saw many, many lead changes. Even with Crown Prince Frederik of Denmark riding in the Hot Seat with Sehested for two matches, the TREFOR crew couldn’t close out the match and fell 3-1 to Dackhammar. The showdown between Sally Barkow (USA), Team Magenta 32, and Johnie Berntsson (SWE), Flux Team, had been the highlight of the previous day as the American and Swedish teams took it to a nailbiting 2-2 sail-off for a thrilling climax. Surely the fifth and concluding match wouldn’t live up to the non-stop drama of Wednesday. But it did. Yet again Barkow managed to overtake Berntsson’s early lead to fire home a crucial third win for the only all-female crew among the 20 international entries. High-fives all round as the Magenta girls booked their place in the Quarters against Taylor Canfield (USA), US One. “We knew we need to calm it down and focus on our own boat rather than worry about the opposition so much,” said Barkow. Canfield, who cruised 3-0 to the Quarters over Sam Gilmour (AUS) Neptune Racing, commented to the TV commentators that based on what he’d seen of the Barkow v Berntsson match, he wasn’t too worried about racing them in the Quarter Finals. Canfield wasn’t sounding quite so bullish when his comments were thrown back at him at the evening press conference by the MC Alan Block, although Barkow admits she’ll have to raise her game against the team’s that tipped as the favourite to win in Copenhagen. “Taylor can have a bit of a temper, so if we can bring that out of him it could help us out a bit,” she said. So today concluded the Super 16 and we are looking at some mouthwatering Quarter Final matches. Aside from Canfield v Barkow, there is the prospect of Hansen v Dackhammar, Iker Martinez (ESP), Espana Racing v Mattias Rahm (SWE), Rahm Racing, and Ian Williams (GBR), GAC Pindar v Yann Guichard (FRA), Spindrift racing. “I’m looking forward to some Frogs Legs versus the Rosbifs in the next round,” smiled Williams in the England versus France match-off between the six-time World Champion and the round-the-world veteran and multihull specialist. That’s the great thing about this new format, bringing together great sailors from such diverse backgrounds and throwing them into the cauldron of short-course gladiatorial combat on the World Match Racing Tour. Friday’s racing is all about trimming down the last eight to the final four for the Semi Finals. Live coverage will be shown at www.wmrt.com from 1400 local Danish time.